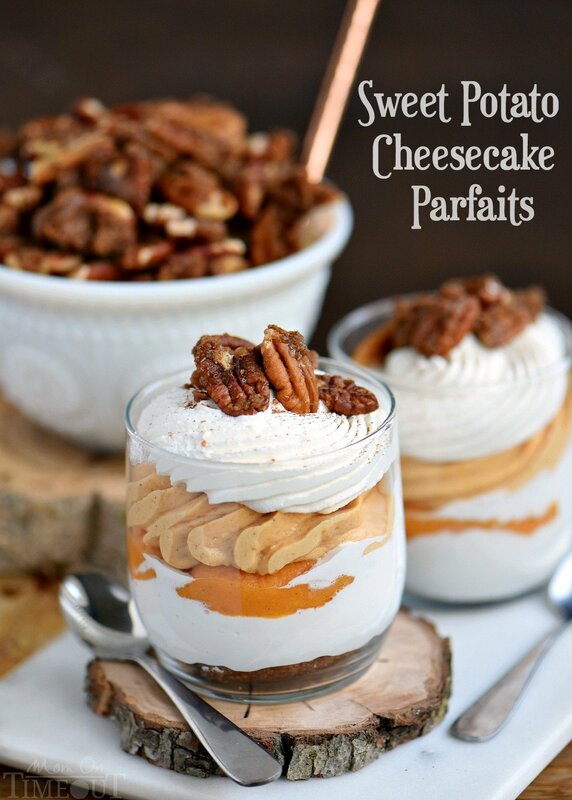 The best dessert I’ve had all year – Sweet Potato Cheesecake Parfaits! Layers of gingersnap cookies, marshmallow, sweet potato cheesecake and whipped cream all topped with candied pecans and a dash of cinnamon! Delight in every bite! 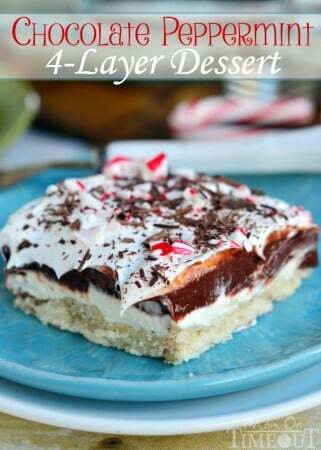 I have a small obsession with layered desserts. I think they are so elegant and the presentation is just so amazing. Everyone always thinks that SO much work went into them, but, the truth is they’re super easy. Shhh… don’t tell anyone! I have a brand new favorite dessert that I’m sharing with you guys today! The great part is that all the components can be made in advance and then the dessert is quickly assembled right before serving. 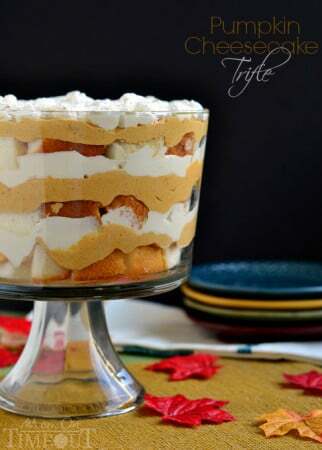 There are six components to this Sweet Potato Cheesecake Parfait. It starts with a ginger cookie “crust”. You can make your own like I did OR you could totally buy ginger cookies at the store – your choice! The next layer is marshmallow creme because what is the best part of a sweet potato pie? The marshmallow topping of course! The third layer is Bob Evans Mashed Sweet Potatoes. With all the other components in this dish, you’re going to seriously appreciate the zero effort required for this layer. They are already perfectly sweetened and spiced and ready to go! The fourth layer is sweet potato no-bake cheesecake. A combination of mashed sweet potatoes, brown sugar, cinnamon and cream cheese. Delish! I was licking the spoon you guys – so good! 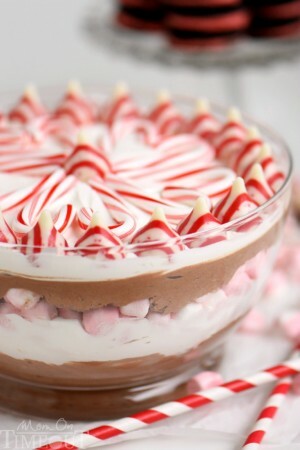 I may be making a no-bake sweet potato cheesecake in the near future, it would be amazing for Christmas! The fifth layer is whipped cream or Cool Whip – you choose. And then finally, I topped it all with candied pecans. Look – the perfect bite! I am absolutely in love with Bob Evans Mashed Sweet Potatoes you guys. It’s something that my boys will eat and actually enjoy and it’s the perfect side dish for practically any dinner. I love that I can take this super convenient product and turn it into something as beautiful as this. 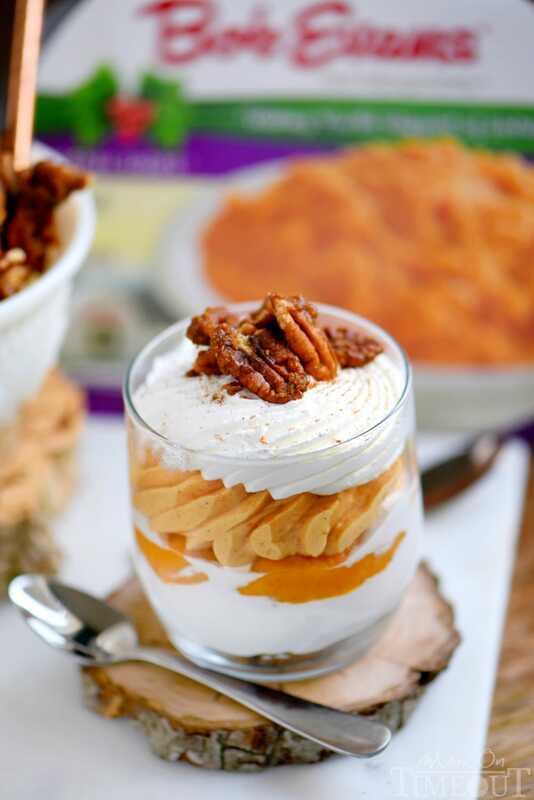 I’ve already had requests to make these Sweet Potato Cheesecake Parfaits for Christmas and I’m more than happy to oblige. They are going to look stunning on our holiday table! I spoon each layer into a piping bag. It helps make these parfaits quick and painless to build. Also, so much neater! If you can’t find piping bags, feel free to use a large plastic bag and just cut off the corner – it will do the same thing. 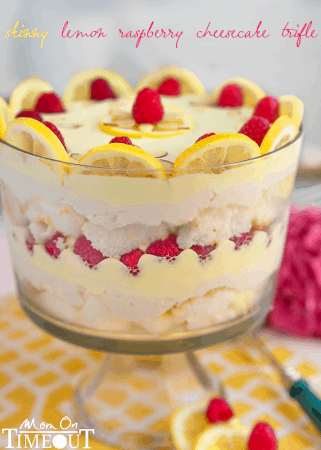 Small glass jars are the perfect way to serve these parfaits. Clear, small bowls will also work. Just let those layers shine through! 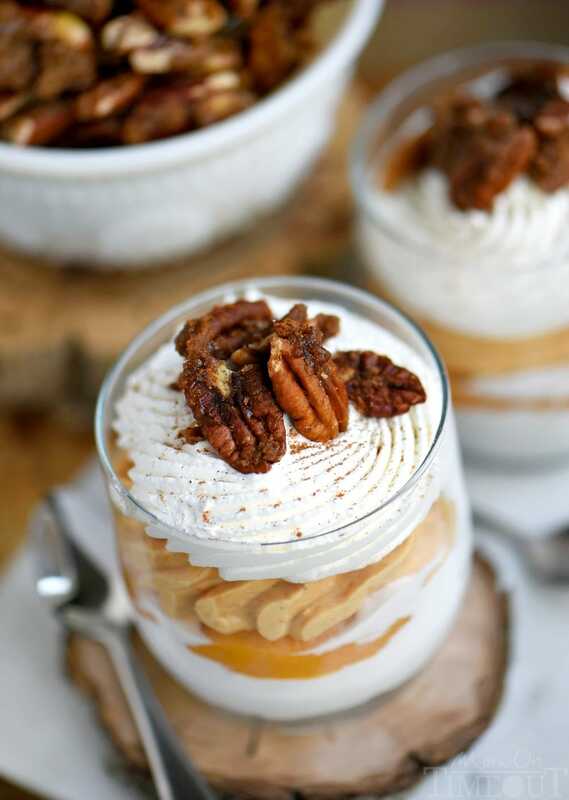 If you don’t want to mess with the candied pecans, don’t 🙂 They do add a delightful sweet crunch to the parfaits though. If you don’t want to make the candied pecans, break up a ginger cookie and sprinkle over the top. The Bob Evans Mashed Sweet Potatoes have to be heated in the microwave before assembly. Do this in advance so you have a chance to chill the sweet potatoes before assembling. 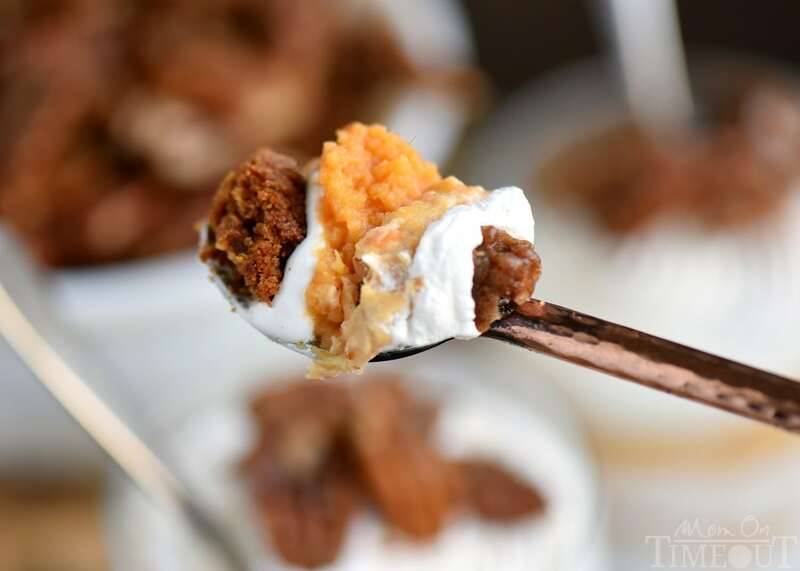 The best dessert I've had all year - Sweet Potato Cheesecake Parfaits! Layers of gingersnap cookies, marshmallow, sweet potato cheesecake and whipped cream all topped with candied pecans and a dash of cinnamon! Delight in every bite! Prepare the sweet potatoes according to the package directions. Chill. In a medium bowl, beat cream cheese until light and fluffy. Add brown sugar, cinnamon and mashed sweet potatoes and continue beating until thoroughly combined. Combine butter, brown sugar, salt and cinnamon in a medium skillet and cook over medium heat for 2 to 3 minutes or until the sugar dissolves and is bubbling. Add the pecans and stir to coat the pecans. Cook for another 2 to 3 minutes, continuously stirring. Remove from the heat, and spread the pecans out on prepared baking sheet. Let the pecans cool. Spoon marshmallow creme, mashed sweet potatoes, sweet potato cheesecake, and whipped cream into piping bags. You could also use large plastic bags and just cut off a corner. Place a cookie into the bottom of a small, glass jar or dish. You may need to break the cookie to make it fit - that's totally okay! Pipe in a small amount of marshmallow creme, followed by mashed sweet potatoes, sweet potato cheesecake, and whipped cream. Top with candied pecans and sprinkle with cinnamon if desired. It’s in the very first line under “Instructions” – Prepare the sweet potatoes according to the package directions. Chill. These are so adorable and creative, Trish! 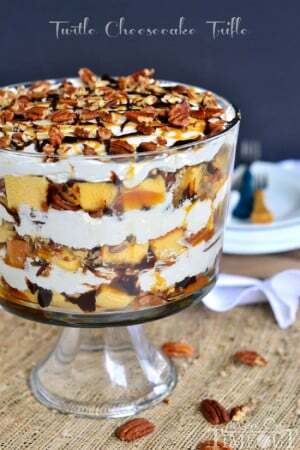 I am such a BIG sweet potato fan and love all the pretty layers! Oh my, Trish, this looks just fabulous! I know it has to be delicious! Why is it so difficult to find this recipe?